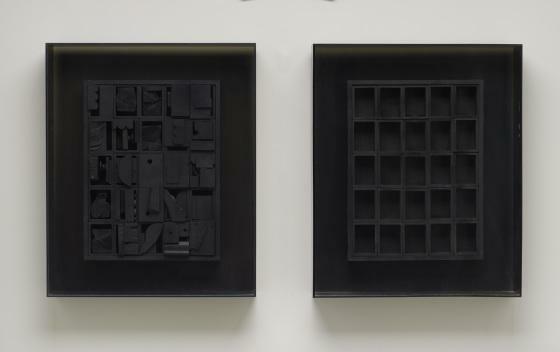 Louise Nevelson is best known for her wooden works composed of collected urban debris. Influenced by Marcel Duchamp’s found object sculptures, which incorporated everyday materials such as sinks and bicycle wheels, Nevelson carefully arranged her found materials into compositions that evoke the sense of a shrine. She unified the different objects, such as dowels and spindles, by painting them in her trademark color, black, which transformed the individual tools from practical objects into an invitation to meditation. 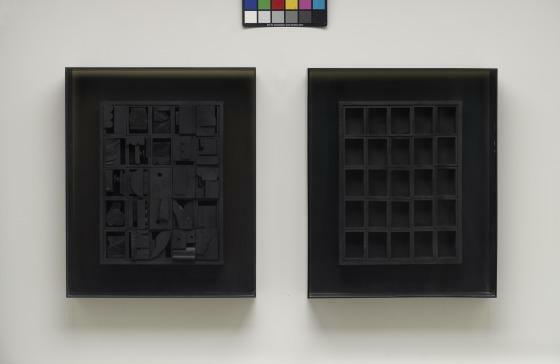 Although primarily a sculptor, Nevelson shared a similar formal focus with the abstract expressionist painters. Diminishing Reflections VIII (Left & Right) explores line, flatness, and scale through careful attention to the relationship between the unique forms of the left and right containers.